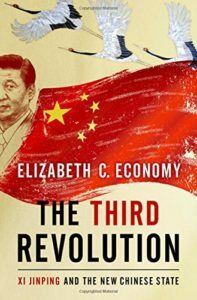 One of the highlights of this book is the extent to which Economy has identified and elevated Chinese voices who are skeptical of the Xi era. In doing so, she helps make more visible the political fault lines of a country which do not make it into China’s official press and only rarely into Western media. Among them, Shanghai Jiaotong scholar Zhang Junhua has criticized Xi’s signature foreign policy initiative as a “product of Chinese neomercantilist thinking” while the former president of Wuhan University has lamented that despite their resources, China’s universities “can barely foster a world-class scholar or school of thought.” But in an anecdote from her own reportage, Economy underscores the importance of the United States in giving these contrarian voices cover. A blogger once critical of the regime told her that after Donald Trump’s election, without US leadership on rights issues, he saw little point in advocating for them in his own country. As a second draft of history, the book is not without need of future revision. Readers may find themselves frustrated by the stop-start nature of the text, in which short sub-sections interrupt any sense of flow and at times create a sense of redundancy. The chapter on China’s efforts to make its economy more innovative is too narrowly focused on electric vehicles at the expense of a broader examination of the government’s Made in China 2025 plan. At times, Economy appears to contradict herself in asserting that the government’s preference for control, however inefficient it may be, may have “longer strategic value.” Yet, elsewhere, she warns this same dynamic undermines the regime’s stability. The book does not attempt a psychological profile of Xi, which is likely for the better, but can leave readers’ unclear as to what motivates his vision and why it won out over more liberal ones for the country. To American policymakers, Economy suggests that they spend more time discerning the domestic changes underway in China, which can give early warning to actions beyond its borders. This requires greater investment in China expertise at a time when the American foreign policy apparatus is shedding talent on all corners of the globe. Economy also emphasizes that engagement, the hallmark of decades of US-China policy, is not enough. The United States must do more to support its allies and countries seeking to balance against China while pushing back more forcefully when China threatens global norms.